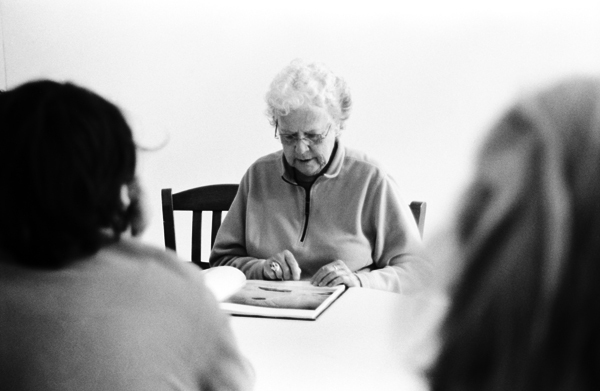 During Easter break, a few students had the unexpected pleasure of sharing a day with the visiting American west coast photographer Marion Patterson. Early one Thursday morning we boarded a boat that would carry us from Paros to the islands of Delos and Mykonos. It was not until we all sat down at a taverna in Mykonos to honor Marion’s 75th birthday that it came to light how she was in the center of a terrifically exciting moment in the history of photography. Marion recalled to us that she had been a student of philosophy and commercial art in California before visiting the photographic studio of an aging Edward Weston. From that moment on she knew she wanted to pursue a life in photography. During her formative years, she studied under Minor White, Dorthea Lange and Ansel Adams, all the while cultivating her own spiritual and artistic vision. A week or so later, Marion presented her book, Grains of Sand, in Liz Carson’s Silver Print class. The works we saw were the expressions of a mature and committed photographer, spanning fifty years of rendering light onto negatives. Like many of her contemporaries, Marion chooses to seek inspiration in nature. Her technique, who she credits Adams for, is masterful. The result is a direct and unencumbered line of communication between the viewer and her images, her descriptions of our natural world, hinting toward unknowns. Marion and her photographs are, indeed, gifts to all who have the good fortune of making their acquaintance. You are currently browsing entries tagged with Marion Patterson at The Chronicle.